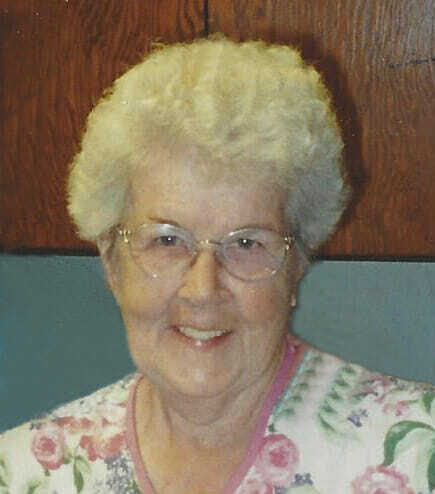 Lois Marie (Jacobson) Langley passed away peacefully early morning, Sunday, October 28, at the Lutheran Home of the Good Shepherd in New Rockford. Lois loved her hilltop farm located between Sheyenne and Warwick where she lived all her life after marriage. Lois was born December 28, 1929, the daughter of Carl and Melinda (Olson) Jacobson, and grew up on a farm outside of Warwick. She was a tomboy and loved being outdoors. She enjoyed riding horse and was an avid climber (including the ski jump on Senior skip-day with her future sister-in-law Gladys (Beckstrand) Jacobson and the farm oak trees for wild grapes to make jelly when she was in her late 40’s). She loved all animals including the pet rabbit that would join her in bed during the night when she was growing up and the pet deer she raised from a fawn. She drew the line at skunks though when her daughter and son brought one into the kitchen to show her the baby black and white “kitten” they had found, she ordered it “OUT OF THE HOUSE!” However, later that night she was spied feeding it via an eyedropper. She attended Dakota Business College in Fargo and upon graduation, managed the accounting work for the Fairmont Dairy in Devils Lake. The year before her marriage, she taught at the Hillsdale Country School. On June 10, 1950, she married Frank Langley at the Warwick Lutheran Church (lifelong member) and moved to the farm where she spent the rest of her life. Family was very important to Lois and she always made a point of helping celebrate birthdays – she was known for her “scratch” birthday cakes which were made from almost a dozen eggs. Her home was known by family and neighbors alike for the “candy drawer” that was always stocked with sweet treats for all. Lois was a great cook, although she would never lay claim to that. She also had a “green thumb” – both her house plants and garden thrived. For many years she grew strawberries (shared with many), pumpkins (especially enjoyed by her grandsons), carrots (for the horses) and tomatoes (always started more than she needed and shared plants with sisters-in-law). Lois is survived by: her four children – Cathy (Isadore) Nagel, Richard Langley, Jean (Kenneth) Hanson, and Roger (Diane Carlson) Langley; 13 grandchildren – Kelly (Mark) Vanderhoff, Chad Nagel, Denise (Mark) Husby, Jill (Jon) Taylor, Paul (Laura Meitner) Nagel, Alan Nagel, Jessica Hanson, Cyndi Hanson, Matt (Amanda Day) Hanson, Justin Langley, Jared (Laura Powers) Langley, Josh (Trista Anderson) Langley and Jacob Langley; 11 great-grandchildren – Chase Nagel, Hayleigh and Tanner Husby, Donovan and Oliver Taylor, Piper and Simon Nagel, Cooper and Brooklyn Hanson, and Lincoln and Lennix Langley; her sister-in-law – Gladys; and a host of nieces, nephews, relatives and friends. She was preceded in death by her husband, parents and two brothers – Robert Jacobson and Edwin Jacobson. Visitation: Sunday, Noon to 7:00PM with a Prayer Service at 7:00PM all in Evans Funeral Home, New Rockford. Funeral Service: Monday, November 5 2018, at 10:30AM in Warwick Lutheran Church, Warwick. We would just like to pass on our Thoughts and Prayers to everyone in the family. Sorry to hear of the passing of Lois. We have some fond memories of our visits up North.